Suddenly they heard a familiar voice. 'The cat in the tuuunnel is the cat in the red wooooorld' Purred the Cat in the tuuunel. 'Cat? How did you get here' Said Furbles staring at the cat amazed. 'I flew, so did you i expect' Said the Cat. 'We didn't fly, we walked' Said Way-Loh. 'Well, hoooop on me and I’ll fly then'. Very shocked, the two Furbys got onto the cat and it some how managed to fly upwards into the red sky. Then the cat flew through a hurricane of colour, 'hoooold on' Said the cat whirling and whirling higher and higher! 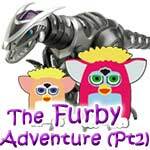 As the cat spun the Furbys where sliding about and grabbing on for life to the Cats tail. Then the hurricane got louder and faster, the cat and the Furbys whirled at a thousand or more miles an hour, then they all leaped up and had landed. But the cat, was different, the cat was a dog! 'I am the Dog in the hurricane' Howled the cat...i mean dog who’s a cat who’s now a dog...whatever it is. 'How...but you’re a cat' Said Furbles. 'I am cat and dog, once passed through the hurricane I am a dog, passed down it, I am a cat' Said the Dog. Suddenly the hurricane entrance closed, and the hurricane was seen in the sky, and just flew out of existence, but how? They had landed in a room covered in wires, and technical gizmos.